This post is brought to you in partnership with the Georgia Watermelon Association. Remember how I said I was going to be using my new ice cream maker like crazy? Well, I have! I thought the best way to end Summer would be with a pile of Georgia Watermelon. 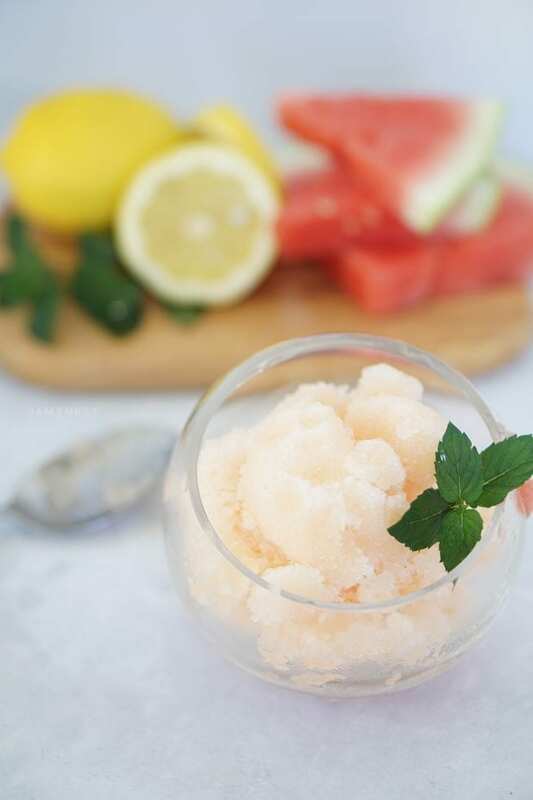 This summer I've been obsessed with the watermelon mint lemonade, I've been making it at home for myself, so I wanted to try my hand at turning it into a frozen treat to enjoy in this heat. It was so worth it. This recipe is really simple to make and delicious. I use a blender and an ice cream maker to make sure I get the best consistency. I also don't strain any of the watermelon or pulp from the lemons because it just helps it thicken. Keep in mind that watermelon has a high water amount, so it will take longer to make this sorbet recipe. Watermelon mint lemonade is so refreshing, and I love when I can freeze things to enjoy them in the hot summer days. This flavor combination is one of my favorites. Depending on the size of your watermelon, you may have extra to eat along with it. Because you can't beat fresh watermelon. One of my favorite ways to eat Georgia Watermelons is to chop it up with some feta cheese and some baby kale to make a fresh summer salad. The juice from the watermelon in my dressing. So good! 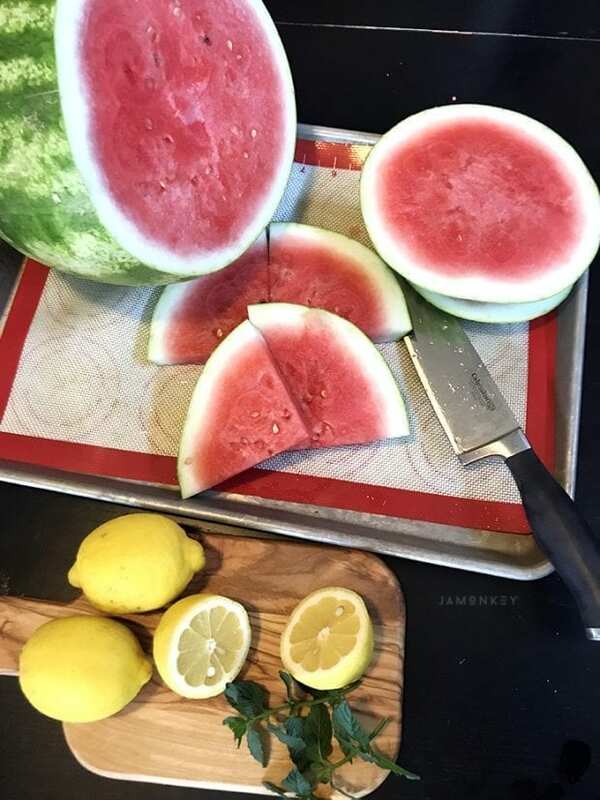 I suggest cutting your water into chunks so that you can deseed the watermelon before you blend it. 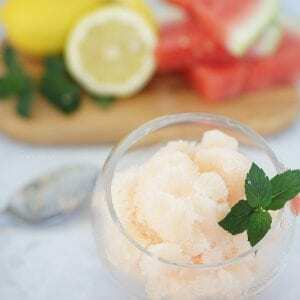 You want to keep the watermelon “meat” for the sorbet. I also like a little lemon pulp in it as well. So I don't strain anything after it is blended. As I mentioned before, watermelon has a high water amount, so it will take longer to make the sorbet than usual. This batch took me nearly 70 minutes to complete because it was a big batch and the water takes longer to freeze. If you were to just throw it into the freezer it would turn into a brick you would have to slush to get out. In an ice cream machine, it churns the liquid so that it freezes properly. Here is how to make this yummy treat! 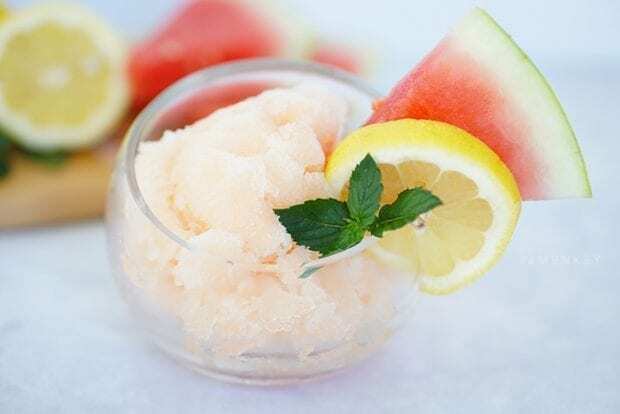 In a high-speed blender, blend the lemon juice, watermelon, and sugar until the sugar has completely dissolved. Take the mint leaves on the stem and slap them into your palm. Place the whole stem (or a tea bag) into the blended mix and place in refrigerator for two hours. Take mint leaves out of the mixture and discard. Continue to make the sorbet according to your ice cream makers directions. When it is complete, store in a container in the freezer.